Time for another Throwback Thursday to one of great Wizard101 articles printed in the Beckett Massive Online Gamer magazine. Originally printed in the February 2010 issue, this article focuses on one of our favorite aspects of Wizard101 – school housing! Ever since the update that introduced housing to Wizard101, people have been fascinated with making their very own personal home in game. KingsIsle has done one better, and in mid-December they introduced school specific houses. These homes (like most things in Wizard101) consist of two payment options. You can pay with gold or Crowns. The ability to pay for homes in either gold or Crowns is a great one, if you’re reluctant to spend Crowns on an item you can always save up your gold. The amount of space in these is amazing, and the layout of each home is exciting and unique to its Wizard school. Another great feature is that you’ll be able to tour each home before deciding on whether you want to purchase it. These homes are sold in the Crown Shop, under the ‘Housing Items’ category. On the right hand side you will see a magnifying glass with a plus sign in it, clicking on that will allow you to port to the viewing version of this home. Once you enter, Myrella Windspar will be waiting to guide you around. She will act as your realtor, showing you each of the unique aspects to the home. By the time you’re done exploring you’ll probably have a new home in your bags, she’s just that good! Let’s see what each home is about. Want to live on the shoulders of a giant Cyclops? Well, now you can. This home is multi-level, and when you first stand in front of it you can’t help but just gasp in awe. Rushing water pours out of your very own water fall, and butterflies flutter all over, not to mention you have an amazing view of a rainbow way up above. When you walk up the front steps you’ll come face to face with your very own swimming pool! Now you can have your friends over for that summer event (or winter, when you’re trying to get away from the cold!). The myth school house also comes with a large expanse of green grass, perfect for putting down those outdoor items. You’ll also get a pavilion with an incredible view; a path leads up to it. To reach the actual home, you’ll have to take a portal located on the right side of the yard and it will bring you to the upper levels. This home is really one of a kind; it even comes with an outdoor balcony complete with a rainbow bridge to walk across. Watch your footing! The inside of the house is just as exciting; with music that really fits the atmosphere. Want an atrium? Now you have one. This house may remind you of a museum, with little nooks and crannies to store all of your precious treasures. Myrella Windspar will talk to you as you enter each room, and even give you ideas of what theme you may want in a particular room. AS with regular homes, the school specific ones each come with a bank to use. Amazing statues grace the entrance to this home, old relics of ancient days that are still in fantastic condition. There’s a statue buried right in the center of it, which really gives the house a lot of character. There’s a guest house (or cottage if you prefer) on the left as you enter, it’s a bit of a fixer-upper but still fantastic for when you have friends over. You’ll have to head down a slope to get into the main house; it’s a bit tucked away. As soon as you enter the main house, you’ll find yourself standing on a precarious edge, looking out at your vast home. It is fantastic; a number of rooms joined by swinging bridges, while a balance figure stands in the center with water rushing over portions of the statue. Myrella Windspar compares the home to an ‘open-air underground villa’ and she is right on. Myrella Windspar is quick to mention that this house is a ‘red hot deal!’ – and she wasn’t kidding. The flames look like they should scorch anyone who walks into it, but thankfully you’ll remain unharmed. This home is a single tower on an island a safety feature for those Wizards dealing with fire magic. There are scorch marks along the ground, and flames lick every available space – the mark of a truly great fire Wizard! This home involves lots of ramps leading to each of the rooms, so be prepared to wear your walking shoes! This home also two entrances, one on the main floor or the ground floor below. Flame covered pillars hold up walk ways, and the raging inferno can be heard no matter where you stand. One of the most amazing rooms is known as the inferno room, with three walls of windows that are beneath the flames from outside. A portal in the room will take you to the attic space. This house is frozen all year round, and sits on top of a giant glacier. There are ice flows and the whole atmosphere just makes you shiver in your seat. You can hear the window blowing as you walk along the ice bridges that connect the islands to the home. The inside of the house is made up of ice crystals, an ice fortress that is cold and frosty year round. The snow and ice glimmers and sparkles, not to mention who doesn’t want a house where it snows inside? 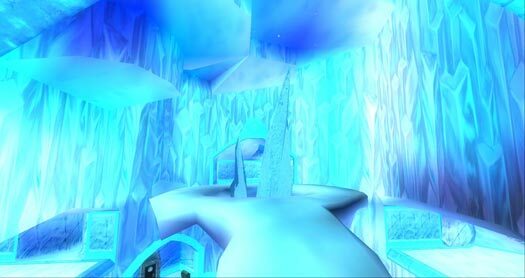 There’s even an ice cavern outside, when the sun shines and reflects off all of the snow it lights up wonderfully. Like each of the other school homes, this one comes with a bank for you to use. This is the only home located in an ocean, the clouds roll overhead and you can hear the anger of the storm that is all around. The home gives off the aura of a submarine, but with a few house items you can have it nice and cozy in no time! One of the best features? The house goes under water, and you get some amazing views in your very own aquarium. You even get your own lighthouse, and caves to sit and watch as storms roll by. Out of all the new school houses, storm is by far my favorite. The attention to detail with this house is just astounding. Ever wanted to live in a giant tree house? Well, now you have your chance. This house is nestled in the branches of an amazing tree, and the property itself is absolutely beautiful. It comes complete with water falls, and its own wading pond. Being able to live inside of a living tree is something that you’ll surely want to tell your friends about! There are even mushrooms and grass growing inside, as the sun shines through and covers everything with an amazing glow. Don’t forget to check out the amazing balconies, they give you a view that really can’t be beat. Everything is so tranquil and serene. Unlike the life school house, this house is dark and scary, candles light the path leading up to the front door, and a swimming pool with a broken diving board can be found along the left side. The house is mansion sized, with a huge staircase in the main room and even a dungeon where you can find a furnace working away. The music leaves players feeling as though a ghoul or goblin may jump out at any minute, and you may be scared to venture into the rooms all alone! Magnificent balconies will let you look out over the main hall, and the entire house has a very elegant haunted feel to it. Now just watch out for cobwebs! Each home has a completely different feel to it that matches its school of choice perfectly. You’re not restricted to which type of house you buy, so even if you’re a death Wizard who loves the storm house, you can purchase it without any problems. Maybe you’re a life Wizard who secretly enjoys the bright flames of the fire school house. It doesn’t matter which house you choose (maybe you’ll want to own them all!) you will surely love the incredible attention to detail that comes with each one. Players are also allowed to own as many houses as they want, you equip them (activate them basically) from your inventory much like you do with pets, decks, and gear. Now, to figure out which one of these amazing houses I want! This article originally appeared in Beckett Massive Online Gamer Issue 18 on May/June 2009 and has been reprinted with permission from Engaged Enthusiast Media by Beckett. What about you Wizards… which school house is your favorite? ← KingsIsle Goes to Comicpalooza! I like the Life house because it is very calm and relaxing. I’d have to say myth. I’m ice but it’s easier to decorate and everything fits in it better. Life and Storm. Storm has got the crashing waves, and the electrifying Triton Statue (No puns added) and the Life house has so much room and beauty. I like the storm and fire. there just so cool. Balance School House. Even if I am Death School. i like the life house because for one i am a life wizard plus i think the life house has a lot of room. Well, looks like I’m the first to say the Storm House. It is absolutely incredible because you are on your own private island and the atmosphere is amazing. I love the idea of the underwater house. Even I am Death School I pick Balance School House. My favorite would have to be the Myth House, because it is really cool looking. haven’t pick anything don’t care so, much wizard101 school house! but most I like well Bundle Houses (did well the Pirate101 School House) but more effect to housing wizard101 LIKE your pirate101 as 🙂 MAKE more interesting! But Choice (Ice) ❤ Immunity Rules 😛 😀 ICE IS BEST! Well, as she said, each house is special in its own ways but, for me, the Fire House, and the Balance House are by far the best school houses that fit me. i like all of them lol!!! !